For those of you who don't know me, I will let you in on a little secret...I am a health nut. When you have had as many digestive issues as I have had...you get to the point where you only want to eat or drink things with a purpose. You always question what will happen if you eat or drink the wrong thing. I have always been into probiotics to ease my stomach in digestion. I am not going to lie...for years it was pretty unpleasant. So, when the makers of Susta asked me if I would be interested in trying out their product, I jumped on the idea. I don't eat very much sugar, but I do like a little sweetener in my coffee and, of course, when I bake. I have tried artificial sweeteners in the past and really have not been happy with the flavor and aftertaste. I was pleasantly surprised when I put this little packet in my morning cup of coffee! It smelled sweet, like fruit, and had no strange aftertaste. It really is tasty! So, a sweetener, with only 5 calories and is made from real natural ingrediants? Sounds great to me! I looked online to find out what the costs were for this product. 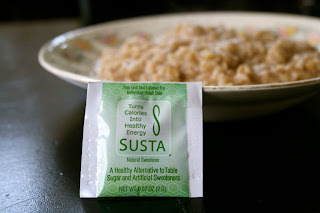 Susta is comparable in price to other sweeteners and can easily be ordered from their site. 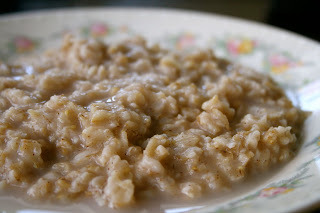 I don't do "sweet" oatmeal, but you know that is the real test for me! I loved it. It added a nice sweetness without taking over the flavor. I also gave it a whirl and baked with it. I tried out some mini muffins using my cobbler recipe as a base. I have never done that before, but thought why not give it a try. These cupcakes are fat free and low glycemic. I am not very familiar with baking with sweeteners like this, so the end result was a little sweeter than I would have liked, but again, I don't really do super sweet stuff. This would be nice to serve to someone that can't have sugar along with some fresh fruit and tea. It is always nice to have recipes on hand for your guests that are looking for a low/no sugar treat. We have quite a few in our extended family that can't have sugar so I will definitely be making these the next time they come over. Preheat oven to 350 degrees. Spray or line a cupcake pan. In a bowl, mix together the susta, flour, baking powder and salt. Next add the milk and applesauce to the dry mixture. Mix just until combined. 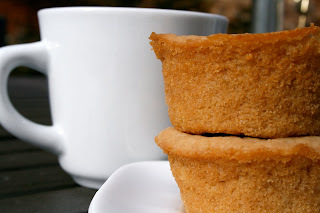 Divide the mixture evenly in 4 cupcake cups. Bake for 25 minutes or until a toothpick in the center comes out clean. Serve warm with a fruit compote or allow them cool and ice with your favorite low sugar frosting. Thanks for the review! I'm not usually a fan of sweeteners, but have recently started enjoying Stevia (after a lot of initial resistance). I love Susta, I have been using it for a couple of months now. Great to know that you can bake with the packets. I know you can use their product that comes in bulk ?? Susta Bowl (on their link) I saw it on TV-with Blair Underwood!!! Katie, it is good. It is always nice to have options! Anonymous, I saw that on their website. It is great to be able to buy it in bulk. They did not send that one to me, but it worked so well baking with it that I may have to get some! Danielle, it is not stevia. Here are the ingredients...inulin, fructose, natural flavors, bacillus coagulans (probiotics), vitamin C, cinnamon extract, goji berry extract, bitter melon, grape seed extract, vitamin B6, niacinamide, biotin, folic acid, chromium, selenium, vitamen B12. I love that it has B vitamins in it since I don't eat meat! I hope that helps!